In order to make some festive party hats we need something besides just materials. We need know-how. We need math! Math isn’t just for adding and subtracting; math is also shapes and rotation. Math includes symmetry! So we’re going to use symmetry (and measurement) to cut out the shapes we need to assemble our hats! 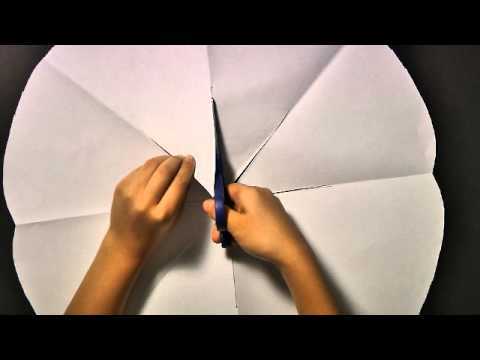 When you fold paper more than once and make a cut, you are most likely creating rotational symmetry. In biology, we call it radial symmetry, like you would find in flowers, starfish, octopi, snowflakes, etc. Basically, it means that if you turn a shape around a central point, the same parts of the shape appear over and over. So, if you follow the same basic folds each time, but make your cuts different, you’ll get different shapes, but all with rotational symmetry. So create your own special shapes to make your party hat unique to you.